Subject: Dora Maar - A model regularly featured in many of Picasso's paintings. Estimated value (2014): $120 million *Based on the sales of Picasso's other works and adjusted for inflation & value appreciation. Google Trends: Ranks higher than Gordon's Gin but much lower than The Scream. History: This painting was given to the British government in 1987. The setting of the featured work is the Spanish Civil War. The lady in the painting is Dora Maar - one of Picasso's most beloved mistresses. She is portrayed to be weeping profusely, in remembrance of the many innocent lives perished in the bloodshed. The mask she is wearing represents the public's silence caused by fear of persecution; the ruthless General Franco was in charge of Spain at the time. The decision to use Maar as the model for this particular painting was not coincidental. In Maar, Picasso saw "the deep reality of life and not the superficial one." 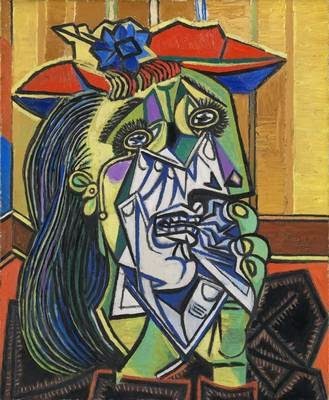 Like most of Picasso's works, The Weeping Woman was created in the cubist style -- a mix of abstract art and motif. This painting is a brilliant mesh of shapes and lines. Picasso was able to capture the intensity of Dora Maar's grief and sorrows using harsh colors and rigid paint-strokes.